While perfectly at home as part of a larger meal, this easy and delicious Fennel Pasta can also serve as a simple one-dish meal. The bit of chile (optional but fabulous) helps warm you right up, and the browned garlic helped bring out the sweetness at the heart of fennel. This recipe easily doubles for bigger appetites. Note: save time by cooking the "sauce" while the pasta cooks; save dishes by cooking the sauce in the pasta pot after you've drained the noodles. Bring a large pot of well-salted water to a boil and cook the pasta until it's just barely tender to the bite (it will cook a bit more in the sauce, so leave yourself some wiggle room). Reserve 1 cup of the cooking liquid before you drain the noodles. While the water comes to a boil and the pasta cooks, prep the other ingredients. Halve the fennel bulb and thinly slice it. Peel and thinly slice the garlic. If using a fresh chile, remove the stem and seeds and thinly slice it. Crush the fennel seeds in a mortar and pestle or put them in a small resealable plastic bag and smash them with the bottom of a heavy frying pan. Mince the parsley. Heat the oil in a large frying, saute pan, or the pasta pot over medium-high heat. Add the garlic and cook, stirring, until it just starts to turn golden and barely brown at the edges. Add the chile flakes or fresh chile, stir to combine with the garlic. Add the fennel, fennel seeds, and 1/2 teaspoon of the salt and cook, stirring, until the fennel softens a bit, about two minutes. Add the wine or broth, cover, reduce heat to medium-low, and cook until fennel is quite tender, about five minutes. Add the parsley, stir to combine. Add the drained pasta and the reserved pasta liquid, stir and toss to combine everything. Increase the heat and cook until most of the liquid is absorbed and evaporated, and all the flavors have combined, two to three minutes. 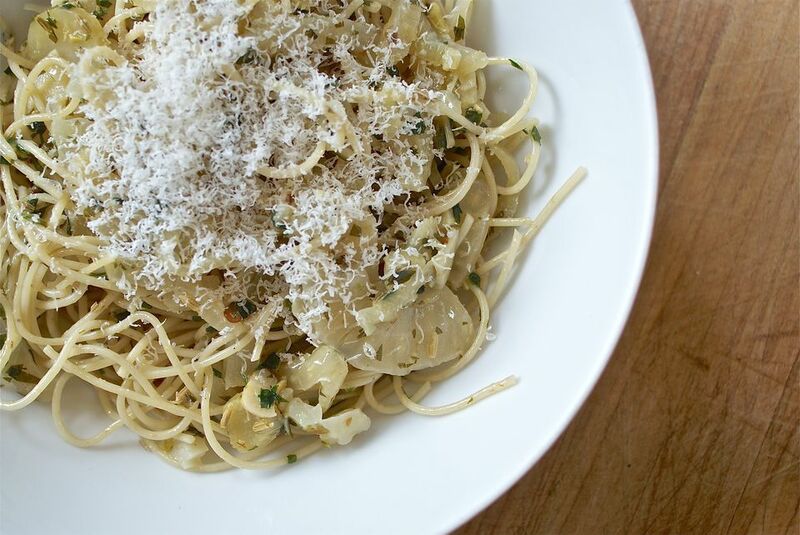 Serve with plenty of Parmesan, Pecorino, or whatever hard cheese you like on top of your pasta.